This Sunday, as the NATO Summit meets at McCormick Place, Afghanistan and Iraq war veterans will attempt to return their military service medals to NATO generals. Local artist and veteran Aaron Hughes has been coordinating the event, as the Organizing Team Leader for Iraq Veterans Against the War. Hughes served in Kuwait and Iraq in the Army Reserve/National Guard. He plans on leaving two medals. After his service, Hughes earned an MFA in Art Theory and Practice from Northwestern, "with the need to express and share his experiences with others and began to use art as a tool to confront issues of militarism and occupation," according to his IVAW bio. 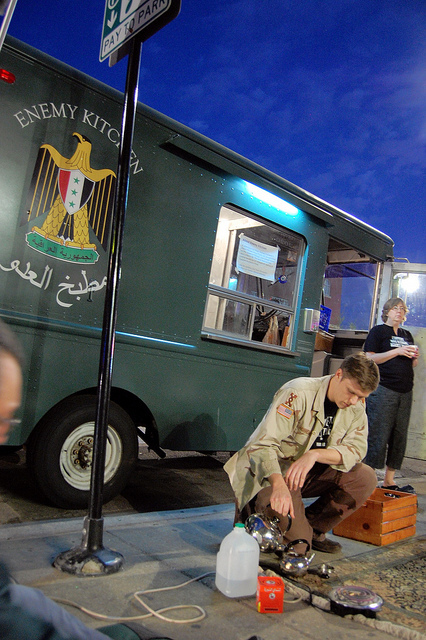 On an unseasonably warm March evening, he performed his Tea ceremony with the Enemy Kitchen food truck. 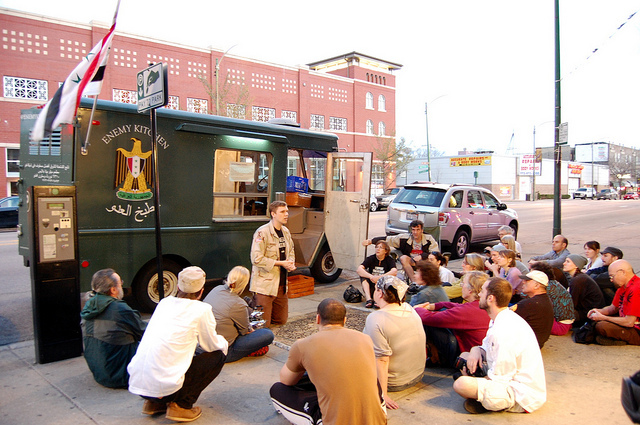 The food-truck-as-art is the work of artist Michael Rakowitz, mentioned previously. 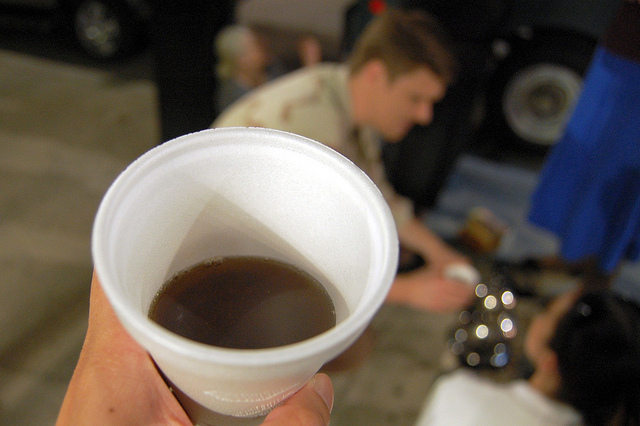 At sundown Hughes unrolled a carpet next to the truck, then began to brew black tea, while fellow veterans, other participants, and passers-by sat down on the wide sidewalk in front of Milo&apos;s Pita Place in West Rogers Park, just off Devon Avenue. He told the crowd about his war experience, and listened as others shared their stories. Hughes then passed inscribed styrofoam cups, spooned sugar into each, then poured the strong hot tea. 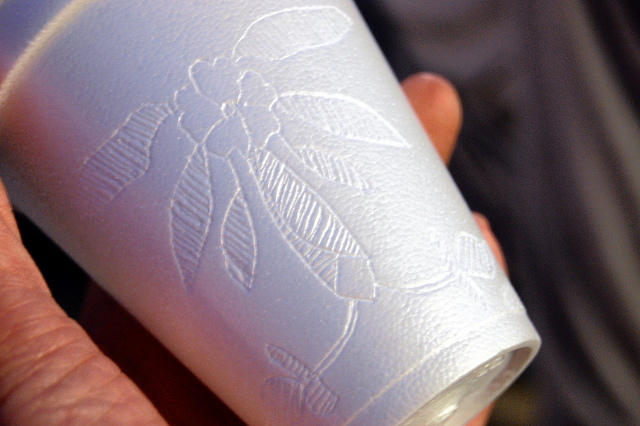 He draws the flowers on each of the cups, as detainees at Guantanamo Bay do. They&apos;re not allowed any possessions, only the Styrofoam cups, which they cover with flowers and designs, though it&apos;s illegal, as Hughes told the story.